This is our Neroli Steam Distilled Essential Oil. Herbal Folk Traditional uses for Neroli as a tonic include in bridal bouquets to calm nervousness before the honeymoon, as a mild stimulant to the nervous system, cleansing the blood and in cosmetics. Neroli Essential Oil is one of the oils that represents the highest expression of beauty the botanical world has to offer! It has a very powerful, light and uplifting floral scent with a fresh, sweet, terpene-like, subtle bitter green top note while displaying exquisite fresh white floral notes. 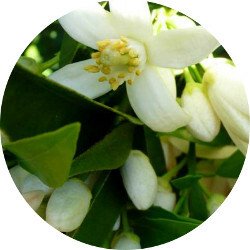 It takes over 2 pounds of the Bitter Orange blossoms to produce 1 ounce of Neroli Essential Oil. Neroli blends well with Ambrette, Amyris, Bergamot, Basil, Black Pepper, Cardamom, Carnation, Cassie, Cedarwood, Clary Sage, Clove Bud, Coriander, Frankincense, Galbanum, Geranium, Ginger, Helichrysum, Jasmine, Lavender, Lemon, Lime, Liquidambar, Litsea Cubeba, Lotus, Mandarin, Melissa, Myrrh, Nutmeg, Orange Blossom, Orris, Palmarosa, Patchouli, Petitgrain, Peru Balsam, Roman Chamomile, Rose Otto, Sandalwood, Sweet Orange, Tangerine, Vanilla, Vetiver, Ylang Ylang and Yuzu. Neroli Essential Oil is also used to make orange flower water and both are used as flavoring agents. Neroli absolute is used extensively for perfumery and especially in Oriental, floral and citrus blends as well as a fixative. Neroli Essential Oil is used traditionally in cologne and toilet water with lavender, lemon, rosemary and bergamot essential oils. Neroli Essential Oil also instills comfort and strength while assisting the release of repressed emotions. Neroli Essential Oil has the following actions: antidepressant, antiseptic, antispasmodic, aphrodisiac, bactericidal, carminative, cicatrizant, cordial, deodorant, digestive aid, fungicidal, hypnotic, stimulant of nervous system, tonic for the heart and circulation.